What did he eat and drink? What was the life of Tutankhamun like? How did he spend his childhood? Where did he live? What did he wear? What was his hair like? Did he wear make-up? How did he spend his leisure time? What was he taught and what subjects were included in his education? What did Tutankhamun eat and drink? 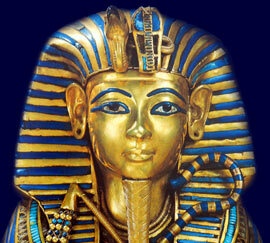 All these questions and more, are answered on this page reflecting on the life of Tutankhamun. The childhood of Tutankhamun was spent at the new city of Armana, where his parents assumed the roles of autocratic rulers. His religious education would have been based on the new religion and the worship of the sole god, the Aten. It was a time of change and enormous upheaval for the people who lived around him. But as a child he would have played with the other children of the royal court. The boys would have played ball games and with animal toys. They also enjoyed more boisterous games and piggy back and leapfrog. Toy swords and spears were used emulating male adults. Marbles, darts and bowls were also used in favorite games for boys. The Nile played such a great part in everyday life that activities surrounding the river were also popular especially toy boats. Tutankhamun would also enjoyed sports related activities such as hunting and fishing. Hunting could be an extremely dangerous sport due to the wild nature of the animals which were hunted, and Tutankhamun would not have been allowed to participate in these dangerous hunts until he was into his teens. He would also have become highly proficient in all military related sports including archery, spear throwing and riding chariots. There are depictions on the tomb of Tutankhamun showing scenes where he is riding a chariot. It is quite possible that he also fought in battles against the enemies of Egypt, the Hittites and the Nubians. No less than six chariots were buried with King Tut in his tomb. The Ancient Egyptians lived in a well ordered society which was administered by law enforcers, judges and courts. All classes of society paid taxes who in turn paid for the government and army. The Pyramid of Power started with the Pharaoh who was the absolute ruler of Ancient Egypt. The Ancient Egyptians loved music and Tutankhamun would have enjoyed music which would have provided a focal point at banquets and religious ceremonies. Life of Tutankhamun - What did Tutankhamun eat and drink? Goat, Antelope, Gazelle, Pelican and various other types of poultry. Fish was plentiful and included Catfish, Tuna, Mullet, Perch and Carp. Bread was made in moulds producing a variety of different shapes and sizes and Tutankhamun would have eaten luxury bread which was flavored with honey, nuts and dates. Everyone drank beer in Ancient Egypt, even the children. Wines were a favorite drink and came in different varieties of red and white, sweet and dry. Tutankhamun would have been raised in a brand new palace at Armana which housed everyone associated with the noble family. The most ornate rooms in the palace were those which would be visited by members of the public. These fabulous rooms were large with high ceilings and painted with exquisite relief's and decorations which would have even included the use of semi-precious stones in the magnificent columns. Ornate, glazed tiles were used to cover the floors. The great palaces would have courtyards, halls, public rooms, dining rooms, kitchens, bedrooms, bathrooms, servants rooms and outside there were stables and landscaped gardens containing flowers, ponds, fig trees, date palms, pools, terraces and sun shades. The palaces would have been opulently furnished and furniture was often inlaid with gold, silver, bronze and precious stones or painted with vibrant colors depicting aspects of the life of the pharaoh. Tutankhamun would have attended the Prince's School which educated the sons of the Pharaoh, members of the royal family, nobles and high officials. The lessons undertaken when he was very young would have consisted of basic mathematics and reciting sums. As he became older Tutankhamun would have received a good, well rounded education with lessons including Reading, Writing, History, Maths, Arithmetic and geometry, Astronomy, Music, Geography, Science and Medicine. Tutankhamun and members of the royal family wore the finest linen. The clothes needed very little stitching as they were simply draped around the body, however the higher the status of the person the more clothes and make-up they wore. He would have had the choice of many different types of jewelry including rings, bracelets and amulets. Many of these items were light and delicate, however, the pectoral form of jewelry was large, heavy and elaborate which was worn on the chest often taking the shapes of falcons and scarabs. The Egyptian hairstyles of children consisted of a shaved head except for one, long plaited lock which hung at the side. This lock of hair was referred to as the 'Lock of Youth' and would have been worn by the young Tutankhamun up until the age of puberty. The 'Lock of Youth' would then be cut off and the same hairstyle as the men - short or shaved, was adopted. Elaborately curled and adorned wigs would have been worn by Tutankhamun at special public occasions and at religious ceremonies. Each section of this Tutankhamun website addresses all topics and provides interesting facts and information about the Golden Age of Pharaohs and of Egypt. The Sitemap provides full details of all of the information and facts provided about the fascinating subject of the Life of Tutankhamun! Life of Tutankhamun - What did he eat and drink?